Restricted powers and a small budget are major concerns with the proposed federal integrity commission. A federal integrity commission is an idea whose time has finally come. The Coalition announced its proposal for a Commonwealth Integrity Commission in mid-December, joining the Greens, Labor and independents led by Cathy McGowan in recognising the need for a body to investigate corruption by politicians and public servants. But not all integrity commissions are equal. Unfortunately, the government’s initial proposal is light on both powers and resources and is unlikely to weed out corruption and serious misconduct. At a minimum, the new commission should be able to investigate and resolve claims of corruption in the public sector. Yet the government’s proposal limits its scope and powers in three critical ways. The government proposes the commission only investigate corruption in the public sector if the federal police or agency heads refer it. The proposal explicitly excludes investigation of public complaints. It also appears to exclude investigation of tips and information from lower-level public officials, journalists and whistleblowers. Closing off the best source of information about corruption — those that have witnessed it directly or heard about it — would severely limit the commission’s effectiveness. Indeed, instead of ignoring public tips, the commission should be a gateway for them. The proposed commission will only investigate conduct likely to be a criminal offence. While criminal conduct should be the priority, the commission should also be able to investigate other forms of serious misconduct. For example, links between financial contributions and political favours should be explored even if an improper motive – required to meet the criminal threshold – isn’t likely to be established. The proposed commission “will not be able to make findings of corruption, criminal conduct or misconduct at large”. Only the courts can make findings of criminal conduct. But the commission needs to be able to report to the public on the outcomes of its investigations. The government’s proposal makes no mention of the commission having any public presence. The commission won’t allay public concern if it operates purely behind closed doors. It should be empowered to publish findings of fact in relation to its investigations and refer suspected criminal conduct to the Commonwealth Director of Public Prosecutions, or serious misconduct to the relevant agency. Public findings from the commission are important to reassure the public that corruption and serious misconduct are being investigated. It also creates accountability for the agencies ultimately tasked with pursuing the conduct. It is equally important the commission makes public statements when it does not find facts to support an allegation, so that public officials don’t live under a cloud of suspicion. The government proposes a commission operating budget of about A$30 million a year. This is supposed to fund the new public sector integrity division as well as a division to investigate corruption in law enforcement agencies – a task currently undertaken by the Australian Commission for Law Enforcement Integrity (ACLEI), with a budget of about $12 million a year. Assuming the law enforcement division requires only the existing ACLEI budget – optimistic given the raft of new agencies the government is asking it to cover – this would leave the public sector division with a budget of $18 million. That’s far smaller than the annual budgets of the larger states’ integrity agencies: NSW $24 million, Western Australia $30 million, Victoria $40 million and Queensland $57 million. A recent review estimated the cost of a well-functioning commonwealth integrity agency at $47 million a year (including a law enforcement division). An integrity commission, even a powerful and properly resourced one, is not enough on its own to ensure well-resourced and well-connected groups don’t have too much sway over public policy. Grattan Institute’s 2018 report Who’s in the room? Access and influence in Australian politics covered the vulnerabilities of Australian governments to this type of undue influence. A number of simple changes could reduce these risks, including capping political advertising expenditure during election campaigns, strengthening the disclosure regime for political donations and making lobbying more transparent by publishing ministerial diaries. Setting much clearer standards for politicians on potential conflicts of interest – particularly relating to corporate hospitality, gifts and secondary employment – would also be a useful complement to the integrity commission’s activities. The government should go back to the drawing board. A weak and poorly resourced integrity commission is only marginally better than no integrity commission. Fortunately, there is time for the government to fix the model before the proposal is put to parliament. And if the government is serious about lifting the standards in public office, it should reform political donations and lobbying rules at the same time. 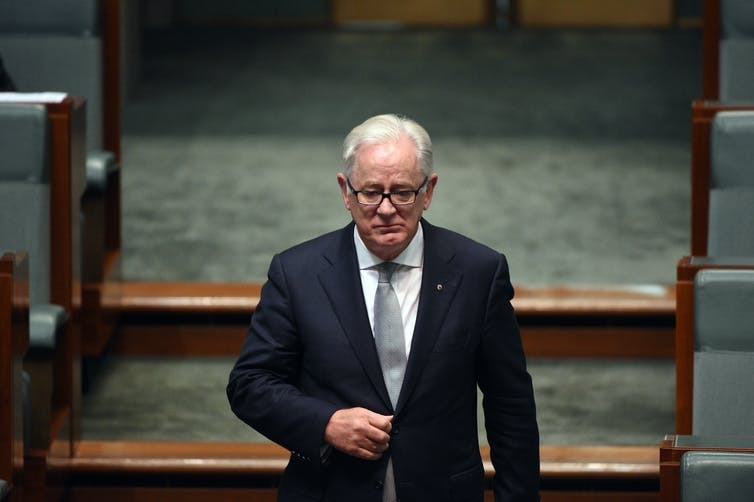 Former trade minister Andrew Robb walked from parliament into a high-paying post with a Chinese company. This week’s ABC Four Corners/Fairfax expose of Chinese activities in Australia is alarming – not just for its revelations about a multi-fronted pattern of influence-seeking, but also for what it says about our political elite. Are its members – on both sides of politics – naive, stupid, or just greedy for either their parties or themselves? Why did they think Chau Chak Wing and Huang Xiangmo – two billionaires with apparently close links to the Chinese Communist Party – and associated entities would want to pour millions of dollars into their parties? Did they believe that, in the absence of democracy in the land of their birth, these businessmen were just anxious to subsidise it abroad? Hardly. Even worse, after ASIO had explicitly warned the Coalition parties and Labor in 2015 about the business figures and their links to the Chinese regime, how could the Liberals, Nationals and ALP keep accepting more of their money? Seemingly, their voracious desire for funds overcame ethics and common sense. And why would former trade minister Andrew Robb not see a problem in walking straight from parliament into a highly lucrative position with a Chinese company? The spotlight is back on Labor senator Sam Dastyari who last year stepped down from the frontbench over a controversy involving a debt paid by Chinese interests. Monday’s program reported that Dastyari’s office and he personally lobbied intensively to try to facilitate Huang’s citizenship application. The application had stalled; it was being scrutinised by ASIO. While the Liberals will, quite legitimately, renew their attacks on Dastyari, the case of Robb, also highlighted in the program, raises a more complex question. Robb brought to fruition Australia’s free-trade deal with China. He announced his retirement late in the last parliament, stepping down as minister but seeing out the term as special trade envoy. He was one of the government’s most successful performers. On September 2 last year Robb’s appointment as a senior economic adviser to the Landbridge Group – the Chinese company that had gained a 99-year lease to the Port of Darwin – was announced on the company’s website. Landbridge’s acquisition of the Port of Darwin was highly controversial, despite being given the OK by the defence department. The Americans were angry they were not accorded notice, with President Barack Obama chipping Malcolm Turnbull about it. Monday’s expose revealed that Robb was put on the Landbridge payroll from July 1 last year, the day before the election, and that his remuneration was A$73,000 a month – $880,000 a year – plus expenses. He did not give an interview to Monday’s program, but told it in a statement: “I can confirm that I fully understand my responsibilities as a former member of cabinet, and I can also confirm that I have, at all times, acted in accordance with those responsibilities”. The formal responsibilities for post-separation employment are set out in the Statement of Ministerial Standards, dated November 20, 2015. Ministers are required to undertake that, for an 18-month period after ceasing to be a minister, they will not lobby, advocate or have business meetings with members of the government, parliament, public service or defence force on any matters on which they have had official dealings as minister in their last eighteen months in office. Ministers are also required to undertake that, on leaving office, they will not take personal advantage of information to which they have had access as a minister, where that information is not generally available to the public. Ministers shall ensure that their personal conduct is consistent with the dignity, reputation and integrity of the parliament. While Robb is not a lobbyist, and would argue that he has not contravened the letter of this code, it is hard to see how quickly taking such a position does not bring him into conflict with its spirit. Why would this company be willing to pay a very large amount of money for his services? The obvious answer is because of who he is, his background, his name, his knowledge, and his contacts. Robb surely would have done better to steer right away from the offer. Both government and opposition, having for years been caught napping or worse about Chinese penetration, have started scrambling to be seen to be acting. Turnbull last month asked Attorney-General George Brandis to lead a review of the espionage laws. Brandis says he will take a submission to cabinet “with a view to introducing legislation before the end of the year”. The government is planning to bring in legislation in the spring parliamentary session to ban foreign donations, a complex exercise when, for example, a figure such a Chau, an Australian citizen, is involved. In an attempt at one-upmanship, Bill Shorten – again on the back foot over Dastyari – says Labor won’t accept donations from the two businessmen featured in Monday’s program, and challenges Turnbull to do the same. Shorten already has a private member’s bill before parliament to ban foreign donations, and on Tuesday wrote to Turnbull calling for a parliamentary inquiry “on possible measures to address the risk posed by foreign governments and their agents seeking to improperly interfere in Australia’s domestic political and electoral affairs”. Out of it all will come action on foreign donations and perhaps tighter espionage laws. But it is to the politicians’ deep discredit that they have been so cavalier about the integrity of our political system for so long. In good news for the United States and the world, Barack Obama has swept to victory in the US Presidential election. The George W. Bush reign will end at the beginning of next year and Barack Obama will be sworn in as the next president of the United States. With the Democratic victory over the Republican Party, President-elect Obama has described his victory as one that brings new hope to his country. Australian Prime Minister Kevin Rudd says it brings new hope to the world – a sentiment that I would certainly agree with. But more than that (or at least as part of that), Barack Obama brings some intelligence to the Oval Office when his predecessor George W. Bush moves out. The Bush presidency has been marked by an endless procession of gaffes (and some unbelievable ones at that). Of course there are some major issues with some of the Obama policies – such as abortion, etc. Now is the time for celebration, soon will be the time of tackling these other important issues that will come to a head soon enough. We must remember that the Republican Party is not the bastion of moral integrity in the United States – just look at the Californian government’s view on several issues (a Republican government under the ‘Terminator’) including that of homosexuality. One must not expect the secular arena to be the bastion of moral integrity – that should surely be the Christian Church as God’s representative on earth. Now that is a major basket case in the United States that we should be more concerned about.